Attach an analog video source and your portable USB device including iPad, iPhone or iPod touch. Simply press a button to start and stop recording. The recordings appear in the play list of an iPad, iPhone or iPod for immediate play back. No computer or iTunes required. iRecord Pro can also record directly to a PC or Mac hard disk. 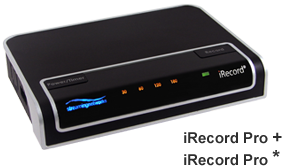 iRecord Pro (PMR-200) is a baseline model supporting direct recording to all iPhones and iPods. 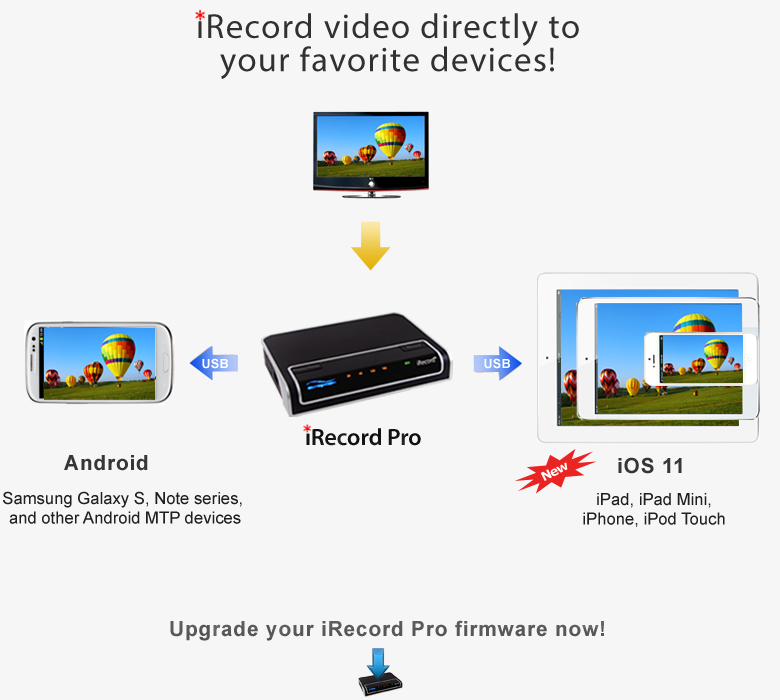 iRecord Pro (PMR-201), in addition, can record directly to iPad. A firmware upgrade supporting iPad is available. The iRecord Pro+ (PMR-202) and iRecord Pro* (PMR-203) models are suitable for business, professional and industrial applications. The iRecord Pro+ firmware includes no watermarking in the video recordings. The preferred recording parameters, other than the default, can be set through iRecord desktop utility and stored automatically to flash for future use. 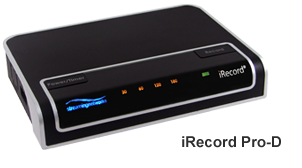 The iRecord Duplicator (iRecord Pro-D) model is suitable for business, professional and content distribution applications. 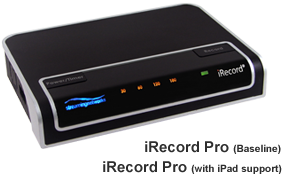 The iRecord Pro-D, in conjunction with the supplied USB hub, supports video/audio or audio-only recording simultaneously to multiple USB devices including iPad, iPhone, USB hard disks and flash drives. Simply connect a USB hub to iRecord’s USB port and multiple storage devices to the USB hub. Now start playing the attached analog A/V source and press record button of iRecord. The contents will get digitized, compressed and stored onto the multiple devices simultaneously. Recording to a single device, does not require attaching of USB hub.